Keep all your GO mobile services handy, wherever you are and whenever you need it. Manage your mobile numbers, bills, top-ups and bundles through an intuitive and secure service for your smartphone that won’t use up your data while you’re on the GO network. Be in control of your top-ups; top-up with ease or view your top-up balance and receipts or history. Keep track of your data, voice & SMS bundles. View remaining balances, activate more or stop recurring ones. You can also get 10GB for only €1 on Pay As You GO plans through the app! Stay tuned for other app exclusive offers. Manage all your top-ups, bundles and bills directly from your phone. 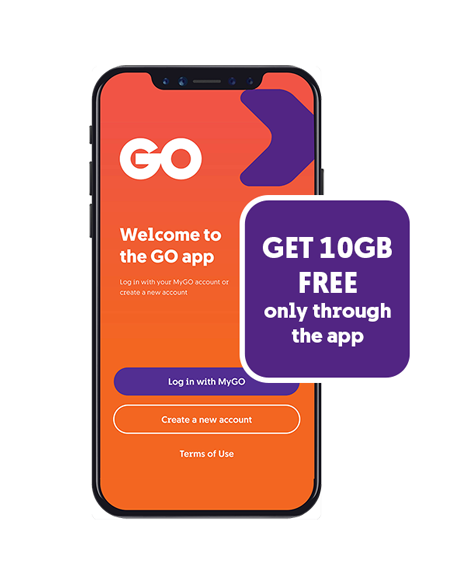 Log in to the app the same way as MyGO. Add your email for easy app login and password retrieval. Save your card details to settle your bills or top up with just a few buttons. How can I get the GO app? How can I pay through MyGO/the GO app? How do I get the free 10GB bundle through the app?